I don’t know about the rest of you, but having two weeks in a row with a day off right in the middle of the week has seriously thrown off my momentum. Despite being shorter weeks, they’ve managed to feel exceptionally long? Who knows- maybe I’m just off still. After dinner last night, I headed to the gym for my workout- as mentioned yesterday, legs (30 minutes) and cardio (55 minutes). For my cardio, I ended up doing a mini circuit on the stairmaster for 25 minutes, then doing 30 minutes on the ARC trainer on the “hill climb” program. Sweaty workout, indeed! I also learned something pretty snazzy last night. 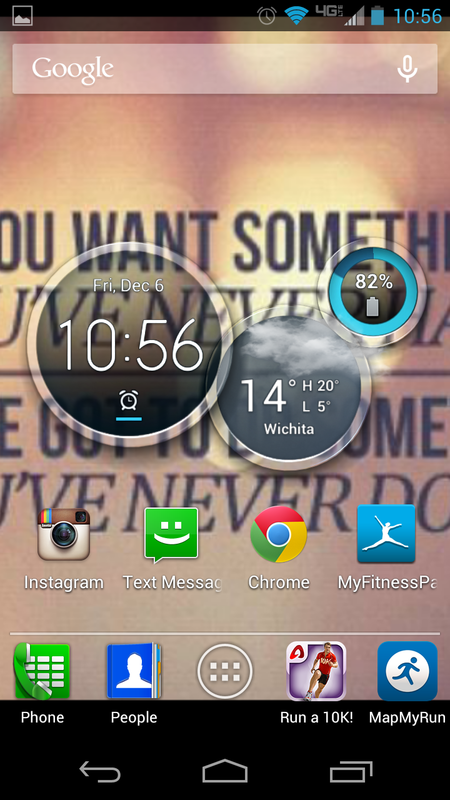 Ya know yesterday how I explained a little bit about my Fitbit, and how I can sync it to the Myfitnesspal app? Well, it does a pretty cool thing when those two get together. On the Myfitnesspal, you can add in all of your foods and calories and also all of your exercise. When you add your exercise, it always asks for the type of exercise, the duration (in minutes) and how many calories you burned during the exercise. 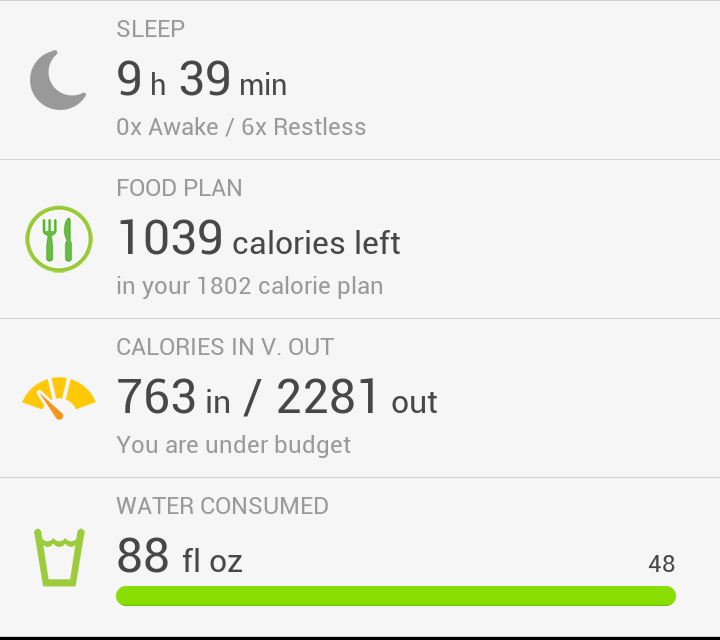 If you input your height and weight into the app, it calculates your calorie burn for you (roughly). I personally never use the original number they give- I usually bring it down by 50-100 calories, just to make sure I’m not vastly over estimating how many calories I’m actually burning. 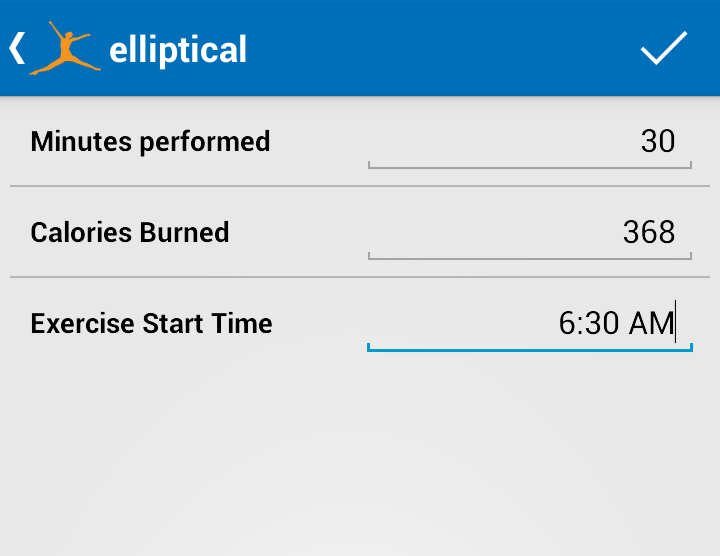 Now, you can input your exercise start time into the Myfitnesspal app as well. 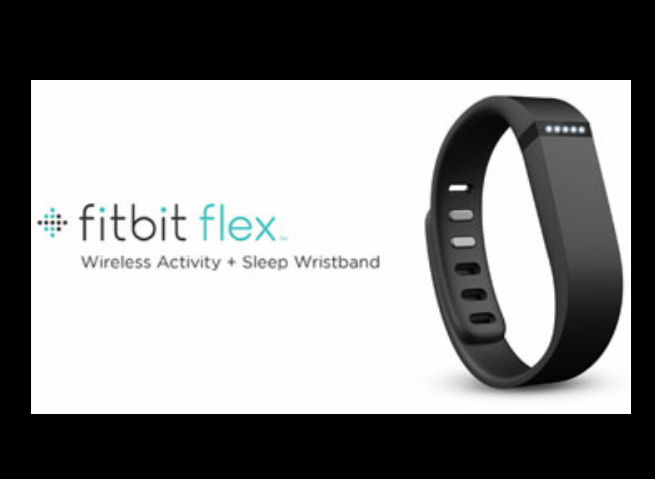 It takes your start time and duration, syncs that to your Fitbit band- and the Fitbit band then recalculates your calorie burn to match your height, weight, exertion rate and heart rate to the alotted time/duration given. 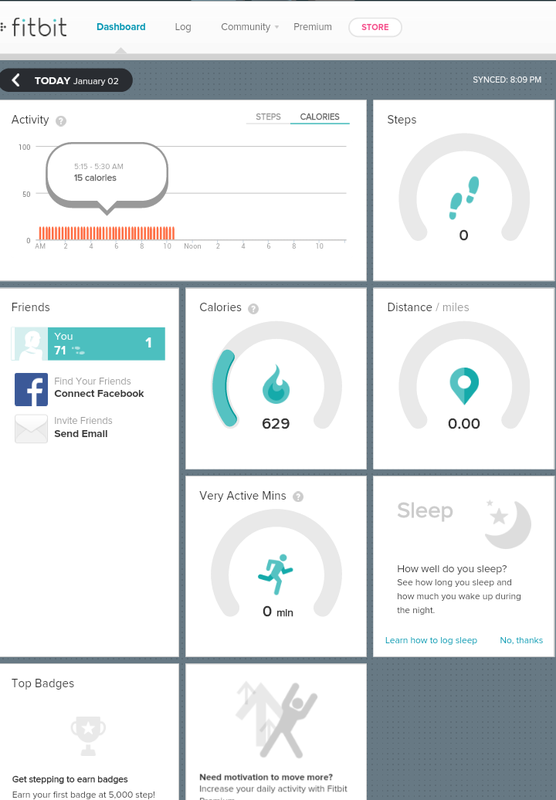 There’s a little thing now on MFP where you can see how much the Fitbit band recalculates your calories burned. Last night, it informed me that I actually burned 100 more calories (based on my exertion/HR) than I had calculated for myself. That’s a pretty great surprise, guys. Pr-etty great. Yep, that’s right! I made my 10,000 steps. I also drank nearly 40oz more water than it said I needed to. Drinking more water and moving more throughout the day are 2 of my “2014 Fit Goals”! Yes, that’s right- I am flat out refusing to call them resolutions because, let’s face it, New Year’s Resolutions only last half way through January. In an effort to really follow through on my goals this year, I pretty much grabbed on to the whole “go big or go home” thing and dug in my nails. 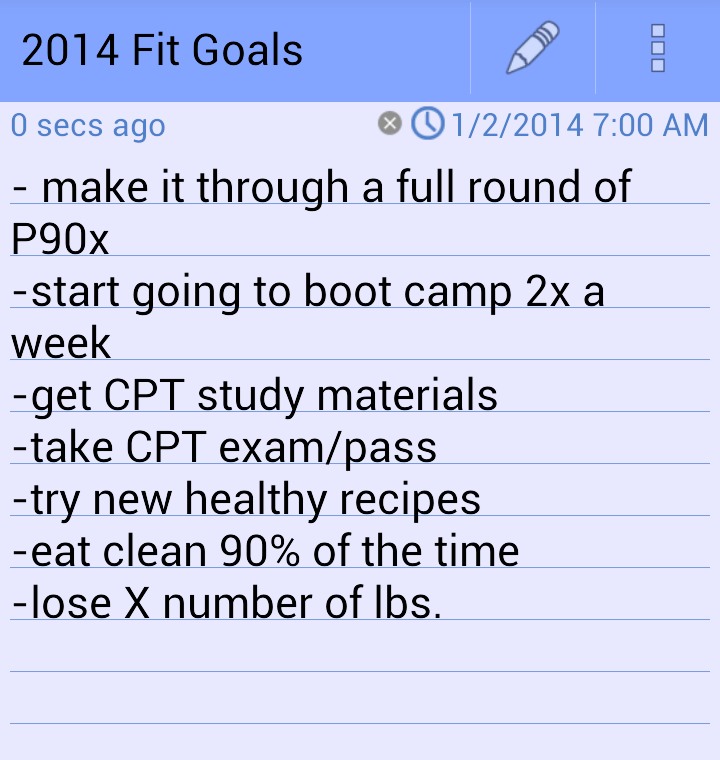 Not only do I have a large amount of “2014 Goals”, but I picked some pretty ambitious ones. That list there is only a few of them. Others (like drinking a gallon of water a day, and taking my 10,000 steps daily) aren’t shown here. So you can see above that not all of my 2014 Fit Goals are necessarilly fitness related- some of them are career oriented, some of them have to do with the wedding, ect. 1) Pick goals that run the gammit– my goals for this next year range from fitness/athleticism, to cooking, to weight loss, to general health, to wedding/marriage, career, ect. They’re all over the place. Not only that, but each goal has it’s own specific time table ranging from 3 months, to 6 months, to a year. Yes- I gave myself a whole year to reach some of these goals. They aren’t “New Year’s Resolutions”, they’re goals for the entire 2014 year. 2) Don’t call them resolutions– I know that I’ve beat this point to death, but the more I say it the more I’m convinced that what you call your goals directly impacts how hard you fight for them. 3) Make a goal pyramid- this is a trick I learned from Jillian Michaels. Now, I know with her you either love, love, love her…or you can’t stand her. I happen to like her. Either way, this is a tip that’s worth implementing because you can use it for all different goal types. Ultimate Goal (3 months) – Lose 20lbs./ Apply to Grad School, ect. This makes it easy to track progress, and breaks a really big goal up into manageable pieces. So, there you have it. Now that you’ve seen my very lofty goals, feel free to make some lofty goal for yourself! And it’s okay if they seem daunting. They should be a mix of short term and long term goals- go at them full force knowing that you have a plan of attack, a time table and a means to an end. Yeah. That just cracked me up. Anyway, I hope you all have a wonderful Friday night! Shane and I have a workout date (yeaaaaah plyo!) and then plans to stay in and watch some of Season 6 of The Big Bang Theory. Do any of you watch? Do you have a favorite character? Happy New Year everyone! I hope everyone had a blast on New Year’s Eve, stayed safe and had a relaxing New Years Day to recover! I know most of us are back to the grind today, so hopefully everyone was excited and ready for a fresh start in 2014! So theoretically then, NYE is the ultimate Saturday, and yesterday was the ultimate Sunday. See how that works? Shane and I had a really great New Year! We got to spend our ultimate Saturday night with some great friends that we don’t get to see very often, which is always a lot of fun. We started out at Old Chicago for dinner, then walked around downtown for a little while before deciding it was pretty much dead due to how “early” it was. A friend was having a NYE party, and it had been a long time since I had seen her or Shane had, so we decided to head there for a little while. 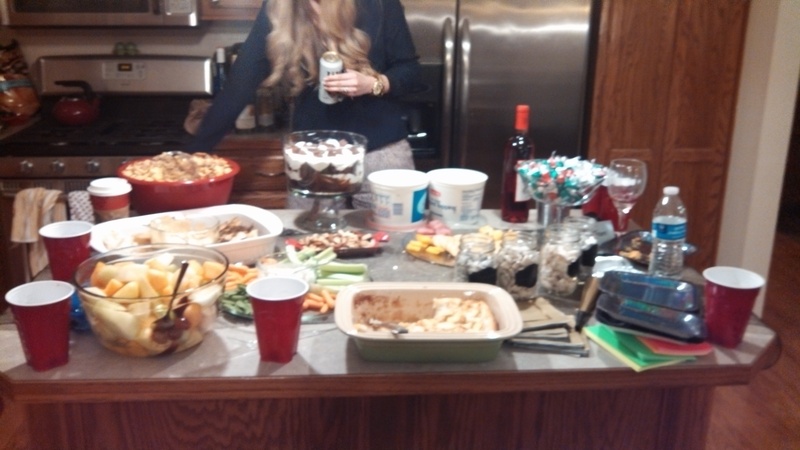 Check out that amazing spread of treats our hostess had going. Hummus, chex mix, fruit and 4 different kinds of puppy chow. 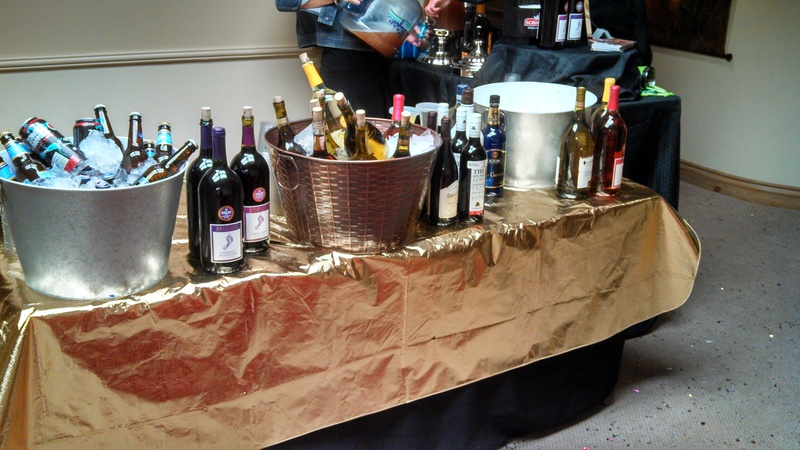 We rang in the New Year at the party with champagne, balloons and confetti- very classic! 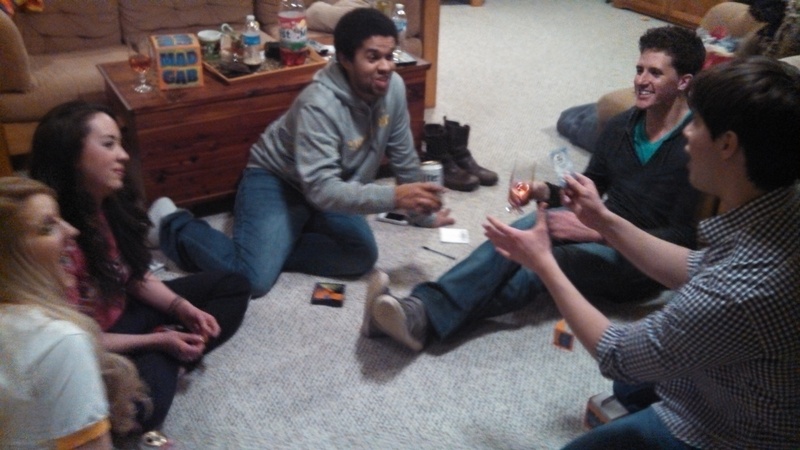 Then we headed over to our friend Anna’s childhood home to keep the party going. We played several rounds of Mad Gab (girls vs. boys, of course), played music, definitely had a dance party thrown in there at some point and headed to sleep around 4:30. It was a great night for sure! I spent yesterday sort of preparing for today, getting organized, doing some Wedding stuff, putting away Christmas presents and the like. It was low key, but I got more done than I figured I would have! Alright, so today being ultimate Monday is great for a couple reasons. A- I feel like I’ve let my workout intensity and consistency slide just a bit these last couple weeks, so I’m looking forward to hitting the gym after work today for a solid workout! B- I’m happy to say that I have logged two healthy meals already today, and I am on track to consuming my gallon of water! 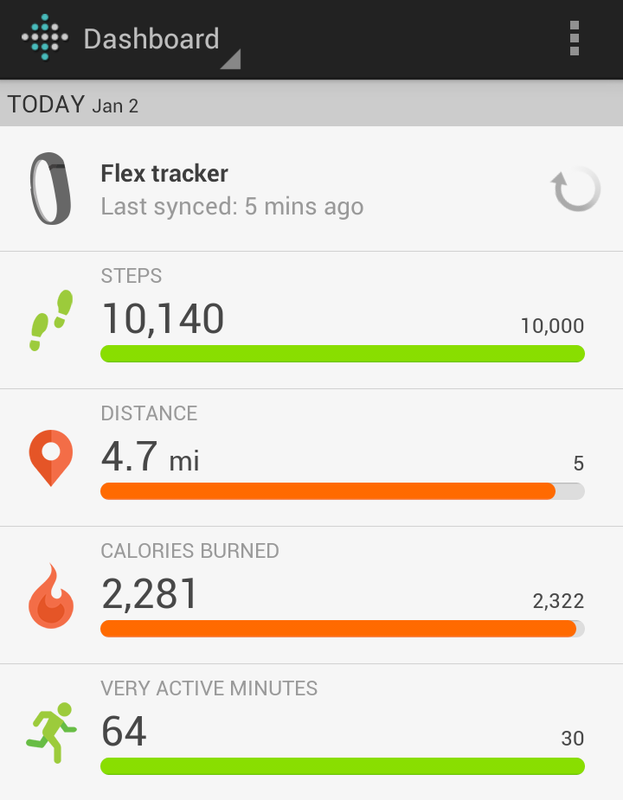 C- My mom bought me a Fitbit Flex band for Christmas, and I just got it up and running last night. Today is my first day getting to try it out at the gym, and I’m really excited to see what all it can do! 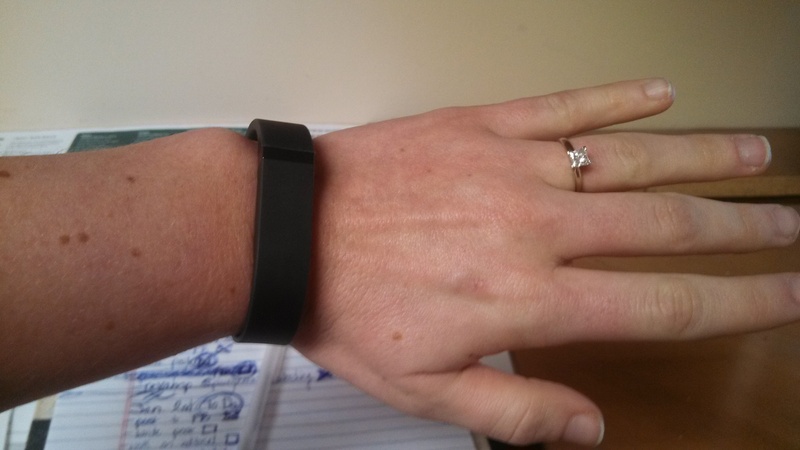 For those of you who don’t know what a Fitbit is, it’s a wireless wrist band with a tracker inside that allows to track and manage daily stats: steps taken, water consumed, heart rate, calories burned, distance moved, intense activity minutes, sleep and a host of other things that I admit I haven’t figured out yet! My mom and I each got one (I got her one, too) and we’ve been playing with them for the past few days to try and figure them out. It’s a learning process, but so far I’m really pleased! My gym agenda for tonight looks like a leg workout and 40 minutes of cardio. I’m not sure what I’m feeling for cardio today, but I’m sure the stairmaster will make an appearance at some point! 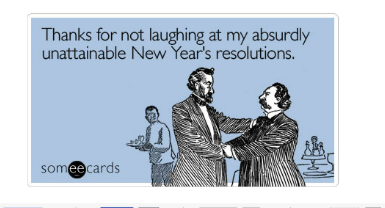 So I know you guys know we can’t skip over the inevitable “New Year’s Resolutions” conversation. This is a healthy living blog, after all! I’m curious to know- what do you guys think? Make them, don’t make them? Are they always bound to fail? Have a great night everyone, and try and squeeze in that healthy meal or god workout to start off your ultimate Monday, too! This week flew by because we were so, so busy- but I’m super excited it’s the weekend, none the less! 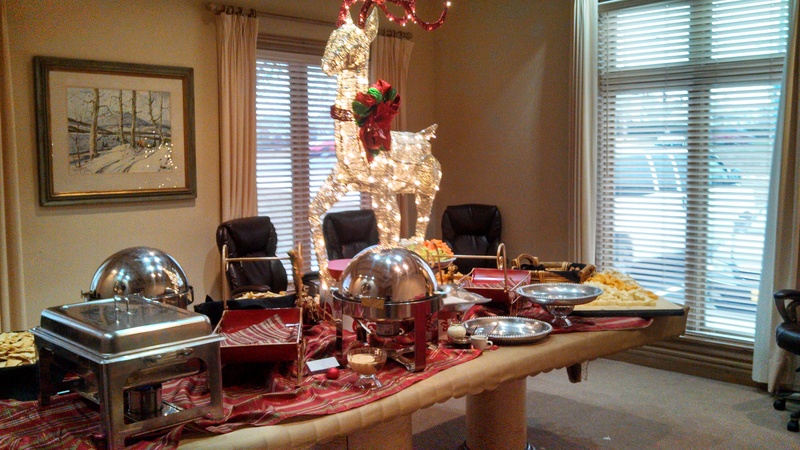 Like I mentioned yesterday, we had our annual work Christmas party last night. 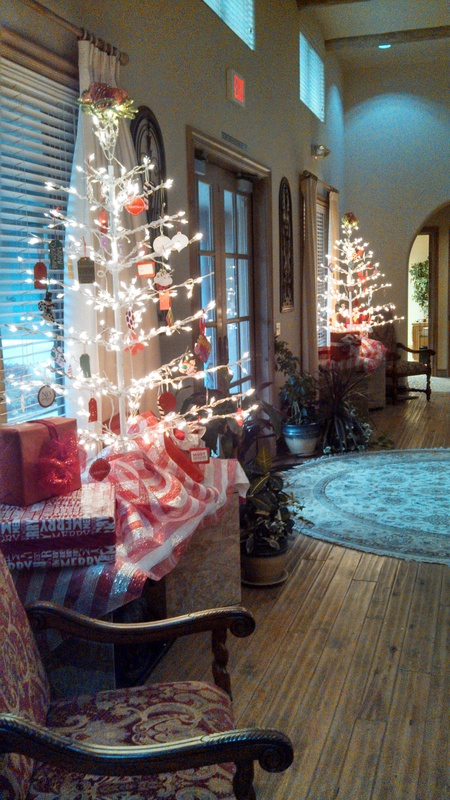 It was a huge success, a lot of fun, and everything just looked gorgeous! There was some incredible food. And loads of very happy people in attendance! It was a great night, for sure. Needless to say, I’m feeling very sleepy today. Not to mention my feet are killing me- I wore such cute shoes yesterday (black suede pumps, about 5 inch heels) but MAN did they ever do a number on my tootsies. In other news, I was extremely excited to find this waiting for me when I got home last night. 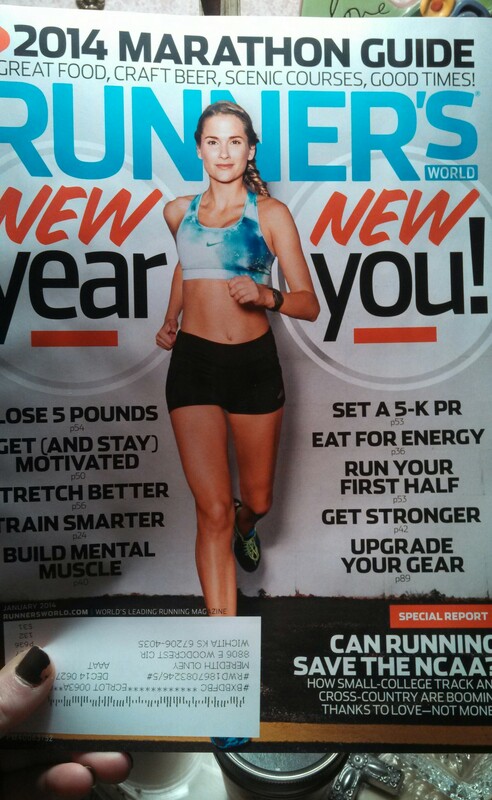 I was especially excited when I saw that it was their New Years issue! WOO! Can you guess which “Resolution” I was the most interested in? 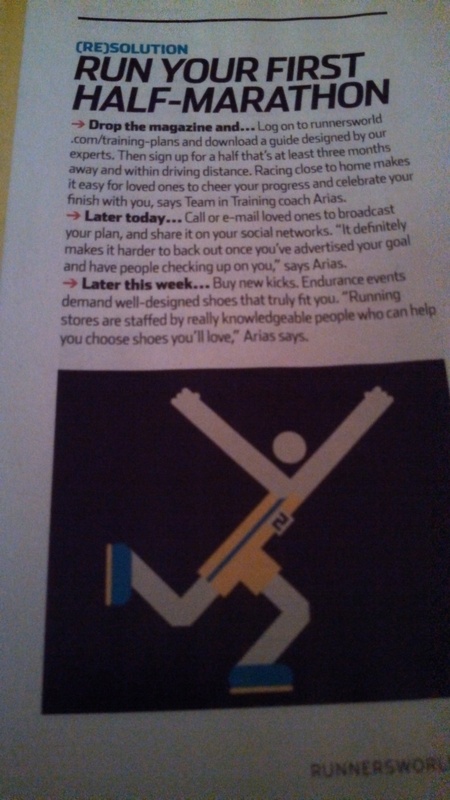 Well, if you guess “Run Your First Half Marathon”- then you guessed right! Running has always been something that I’ve longed to be good at. After a couple failed race attempts earlier in the year, I vowed never to sign up for another race again…until I had solidly trained and knew without a doubt that I could do it. So, I’m working backwards a little bit. 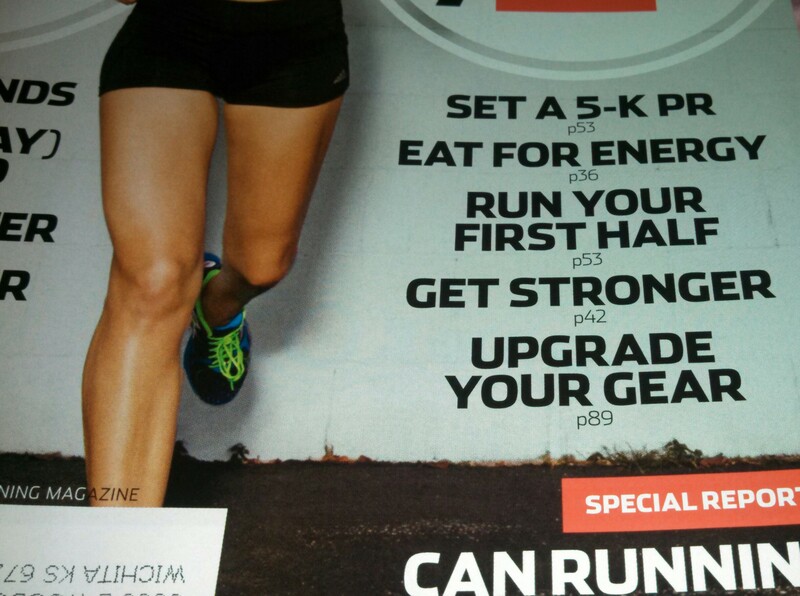 I’m going to train for the half marathon…and then sign up for it. I’ve wanted to tell people that I was running a half for sure this spring, but I held back on this exciting little development until I knew for sure I had the guts to follow through with it! As far as which race I’ll be running, I’m going to sign up for the Prairie Fire Spring Half Marathon that will be happening here on May 4th. I’m feeling especially excited about it because after I run it (which I will!) I can say that I ran a half marathon before I got married! I have no idea why this is important or exciting to me- but it is. So, in preparation for my race, I’ve downloaded a new app to help me with my training. 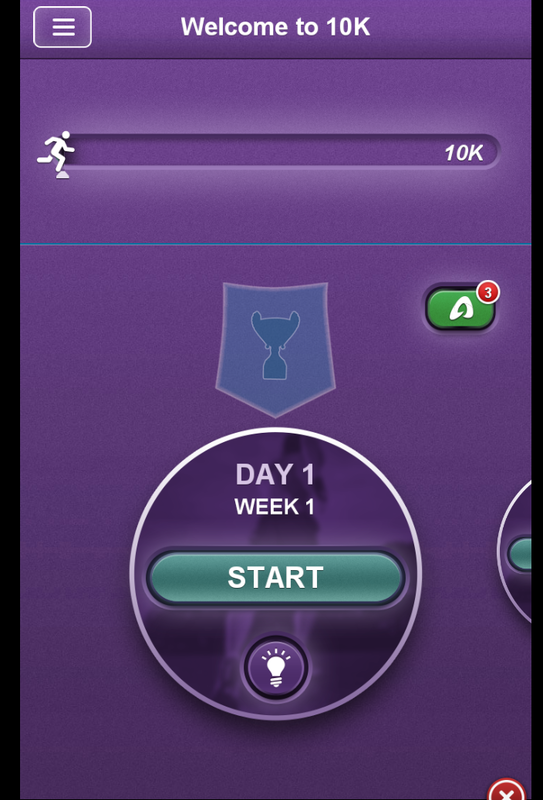 Yes, I know it says it’s a 10k training app. Snazzy, right? This thing is great. I plan on trying it out on Sunday- I’ll be sure and let you guys know how it goes!